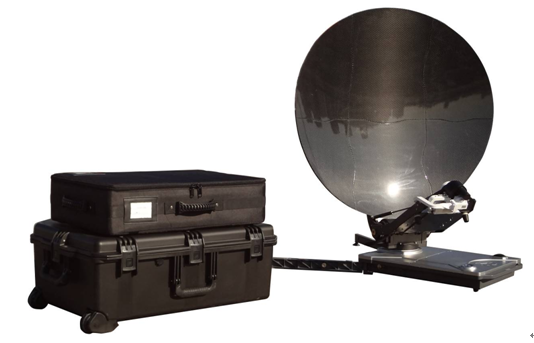 The new generation of the ATSK0750 Portable Automatic Satellite Communication Antenna is designed and manufactured by Alignsat Communication Technologies Co.,Ltd. The antenna is typically owned and operated by the following industries and customs: the Government Emergency Communication Department, the Civil Defense Department,the Media, the Communication Operator, the Police, the Fire-fighting Department, the Army, the Corporations with monitoring applications and so on. The system is equipped with the feed system and the high-performance single offset carbon fiber parabolic reflector which has the equivalent diameter of 0.75 meter. The reflector focal length is shorter than the previous version in order to make the transportation and operation easier. 1 High Integration: The reflector is designed with the consideration of shorter focal length and non-detachable feed. The BUC is connected with special hard waveguide, which realize the design concept of integrated structure，in order to achieve a beautiful and decent appearance. The height of the antenna in stowing state is lower than the previous version and the weight also get lighter in order to use smaller box for transportation. 2 Universal Design: The design of the host structure is made under the consideration of commonality and the feed arms are compatible for the main BUC and LNB, which is of 60W power. 3 Multi-control Mode: Hand-held terminal (wired), PC (wired, wireless), One-button. The system has the built-in WEB interface ensure that the PC and wireless control terminal can access the system without installing any software. 4 GPS Receiver: The GPS Receiver is embedded on the host panel. The control software is integrated with longitude and latitude info table in order to check the antenna location. 5 Polarization Closed-loop Adjustment: Better anti-interference performance for Cross Polarization, preventing the Cross Polarization turn worse as a result of the incline ground situation. 6 BUC Monitoring: The BUC Monitoring functional area is display in the antenna control panel. The BUC operating state can be checked and controlled in this area. 7 AGC Satellite Acquisition: The modem output AGC signal can be used for Satellite Acquisition. This function will be the back-up option if the beacon is broken. 8 One-button Operation: All the antenna operation except Parameter Edit can be completed by clip the One Button Operation button. 9 High-Performance Digital Beacon Receiver: More reliable. 10 Locking Main Beam Judgment: The Locking Main Beam Judgment function is automatic in order to prevent locking in the sidelobe. The accurate rate of prevention will be 100%. 11 Efficient Power Supply System: The appropriative integrated power supply system provide stable and reliable power for the whole system which include LNB and BUC which has the request of 60W power supply. 12 Precision Driving System: The Azimuth and Elevation Driving System is made up of appropriative precision devices. The structure of the system is designed with highly reliability which ensure the antenna operate in all-weather and with long service life. The reflector will keep still when interruption of power supply happens. 13 High Waterproof: The host is adopted the integral seal design which meet the requirement of rain defense in order to promote the protection level to IP55. The system can operate in all-weather condition safety and reliably. 14 Operating Convenience: The system is operated in the whole automatic mode, realizing the One-button Satellite Acquisition function. The manual mode is also available under the special circumstances. The ATSK0750 antenna is made up of several parts which include the 1m Gregorian reflector and feed subsystem, the BUC subsystem, the LNB subsystem, the GPS positioning subsystem, the servo drive subsystem, the automatic protection subsystem, the beacon receiver subsystem, the ACU, the position detection subsystem, the polarization automatic adjustment subsystem, the intellectual control terminal, the intellectual control software subsystem, the integrated power subsystem and the manual control subsystem. The antenna host is loaded in one transportation case individually. The other fittings which include the reflectors, the hand-held controller, the power cable, the IF cable and the hand crank are loaded in the other custom transport case. The host transport case is imported from America meeting the military-grade requirement. The host case is made of high quality resin, equipping roller and pull bar. The size is 795mm×518mm×310mm. The custom fitting case can be carried on back or in hand, meeting the requirement for road, railway and air transportation. The internal structure can protect the fittings. The size is 660mm×450mm×160mm. The antenna host is loaded in the case and the other fittings are loaded in the backpack. The host transportation case is imported from America meeting the military-grade requirement. The host case is made of high quality resin, equipping roller and pull bar. The size is 795mm×518mm×310mm.The other fittings which include the reflectors, the hand-held controller, the power cable, the IF cable and the hand crank are loaded in the backpack which can be carried on back of a single person and meet the military-grade requirement. The size is 650mm×550mm×200mm. One-button Indicator in the middle of the button, indicating the operating mode of the antenna. BUC Switch A ring type indicator in the button, indicating the power supply of BUC.